Well, where do I start? Maybe by saying Prague and the exhibition were amazing. 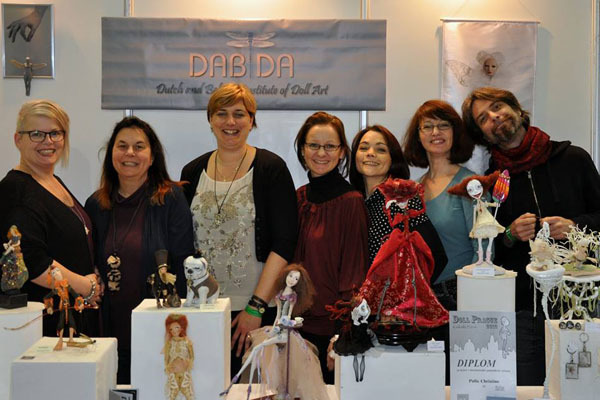 I got an invitation from Bohdana Klátilová, who organizes the Doll Prague exhibition, and with a few other members of dabida we exhibited there for three wonderful days. I had a great time with Saskia Hoeboer, Caroline van Stiphout, Marlaine Verhelst, Francisca Marcus, Christine Polis and her husband Benoit Polvêche. It was quite a challenge to get there with three suitcases and only two arms. 😀 First my parents brought me by car to the train station. Then I took the train to the airport, but I had to switch trains on the way. Not easy, but I did it! 🙂 The flight took about an hour. Then I was brought by taxi to the apartment I shared with Christine, Benoit and Caroline. First evening I arrived quite late, so I went straight to bed. When I arrived the next day at the exhibition I was so excited, the michna palace, where the event took place was so beautiful! I met the other artists, Saskia, Marlaine and Francisca and we started putting our dolls on the table. Although our table was quite full and our work is very different, the presentation was balanced. Our table and the DABIDA members: Saskia Hoeboer, Marlaine Verhelst, Caroline van Stiphout, Kathleen Engelen (me! 😉 ), Christine Polis, Francisca Markus and Benoit Polveche. 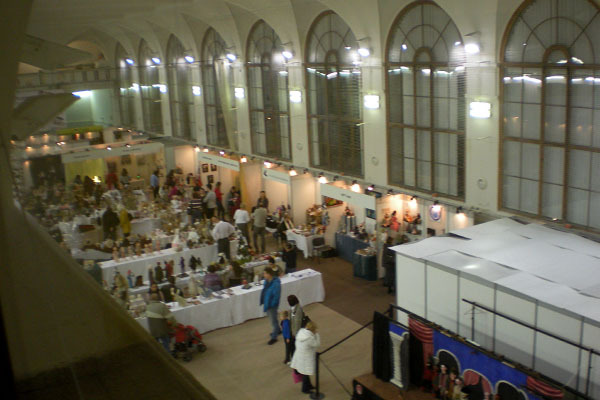 A lot of doll artists and collectors from all over the world came together at this beautiful event. And believe me, I felt like I was in art doll’s heaven. Many other women felt the same way, you could see it by the sparkle in their eyes!! 😀 We were all so excited! Did you see that amazing porcelain doll over there? And that beautiful embroidery on that costume over there? And that really fine silk velvet with the lace? And so it went on for three days, lol! Seeing all this beautiful work from other artists and the high quality fabrics and embroidery got me so inspired. While we were sitting next to our table, we talked a lot about sculpting, costuming, embroidery techniques,… I honestly can say that I learned a lot in these three days. I discovered some wonderful artists I didn’t know before, and met some artists in real life that I only knew through the internet. It was great to meet E.J. Taylor and his work. The lovely ladies Laura Scattolini and Siu Ling Wang had their booth only a few meters from ours, it was great to finally get to see their dolls in reality. It was a pleasure to see the details of their work that do not always show on pictures. 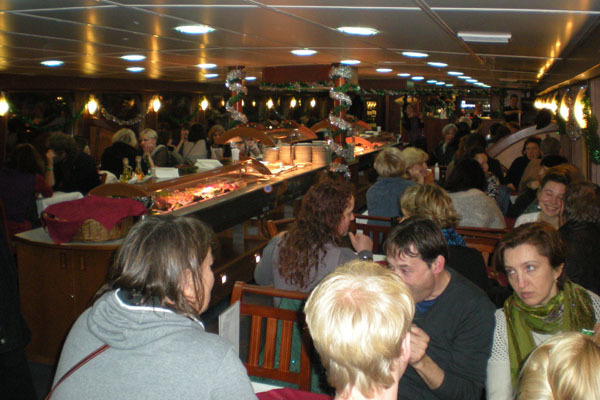 The first evening we joined all the exhibitors for an evening party with dinner at a beautiful cruise on the Vltava River. Meanwhile, we could enjoy the fabulous views of Prague and its sights. About Prague itself, I have to say I fell immediately in love with the city. 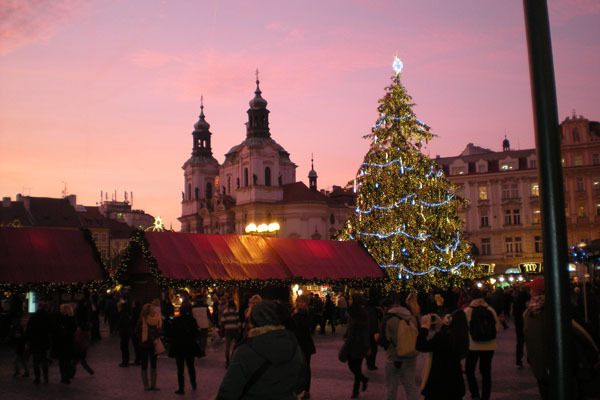 The beautiful decoration on the houses, the market squares, the Christmas decorations, it all added magic to the city. The light changed so beautifully during the day. The pale light of the sunset shining through the fog over the Vltava river gave the city a mysterious atmosphere that I have never experienced before. It truly is a magical city. We noticed that dolls are a big part of Czech culture. 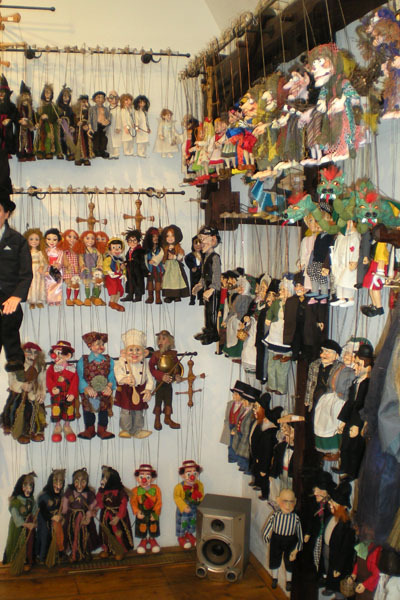 There are marionette shops all over the city, all filled with beautifully marionettes carved out of wood. I visited about three Mucha exhibitions in Prague, lol. All of them very worth wile! I’m a huge fan of art nouveau, and so are Christine and Benoit, so we had a great time exploring this wonderful art form throughout the whole city. Our apartment was close to the Charles Bridge, so we had the pleasure to pass it a few times a day. I hope you enjoyed the article and the pictures. Thank you very much for your support! It really means a lot to me!! A merry Christmas everyone and a happy New Year!! Thank you so much for taking the time for letting us know and for sharing so much beautiful pictures . The first time I saw many artists was in Paris in 2006 and I was so HAPPY and much more that I wrote what you know …. I saw Siu and Laura, and also Hannie … and much more artists and also a doll of E.J .. Many years after, I see that young artists and less young artists continue to share, meet and try to travel and make this art ALIVE . Thank you, Aude. I remember the first doll shows I visited years ago, too. 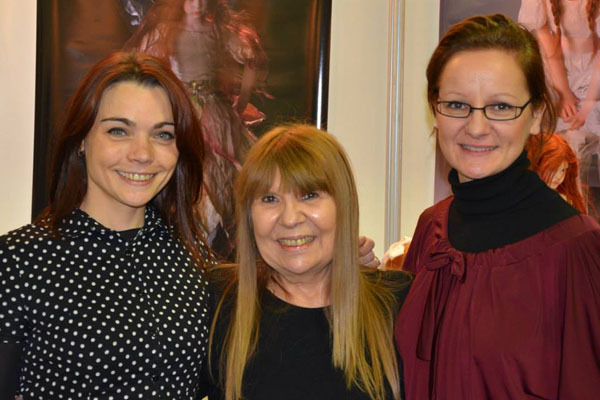 I met Hannie Sarris, and Yvonne Flipse and their work for the first time. And many other artists, of course. It sure was a magical feeling. It’s a joy to see that others that come to see my work, feel the same magic as I did back then. This was a great report! Thank you, Kathleen! it sure was a wonderful show. And it was very nice to meet you there, we had such a great talk. Het is duidelijk dat je hebt genoten, doe zo verder. ik heb er inderdaad van genoten, en fijn om te horen dat het artikel dat weergeeft. Wat een leuke foto’s ! Ook een verscheidenheid in poppen. Ongetwijfeld hebben jullie genoten en ook veel gezien ! fijn Kerstfeest, zeker een creatief en gezond 2014 ! Nog veel succes ! er was echt een heel grote verscheidenheid aan poppen, inderdaad. Heel erg leuk om te zien, en we hebben ervan genoten. Ik wens jou ook nog heel veel succes en hopelijk tot op de dabida-dag! Prachtig verslag! Dit zorgt weer voor heel wat nieuwe inspiratie! Goe bezig!! !